Dungannon Swifts winger Paul McElroy could miss the rest of the season after suffering an ankle injury in training. The 21-year-old has been a key player for Rodney McAree's team this season, scoring nine times. "Paul is out, maybe for the rest of the season - we are hoping to get him a CT scan and he might need an operation," McAree told the Belfast Telegraph. "It looks as if it's going to be a minimum of three months. It's a massive blow as Paul has been doing so well." McElroy sustained the injury last Thursday and missed the Irish Cup victory over Warrenpoint Town two days later. 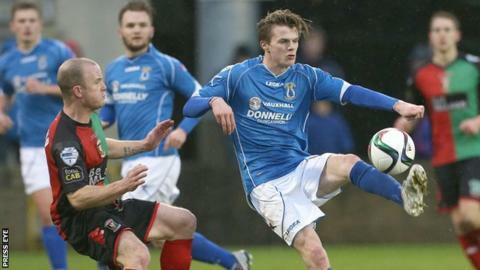 His goals have helped Dungannon move up to ninth in the Premiership standings.